5 tot 9 days, first day option: visit or Nice. Selfguided walking trip from hotel to hotel from Nice. You can plus packages ** and ***. Sometimes you will have to do some short train transfers which are not included in the packages..
A forgotten path, even in wintertime beautiful, with all the orange-and lemon trees along the path heavy with fruit. The path goes down from the mountains to the sea, winding from one valley to the next, passing perched villages, pine trees and olive orchards. During a number of centuries, it was the main salt route, a important source or prosperity. The path leads you along the “plus beaux villages perch�s”, the most beautiful high villages, of the C�te d’Azur and the surrounding country-side or Nice. In this walk you will discover and admire the painted chapels and churches with altars painted by local painters of an interesting school, Les Primitifs Ni�ois, with Louis Br�a as the most important exponent. - Beautiful trails, from the mountains down to the sea. You are expected at night in La Brigue, the starting point orfthe walk, but we advise to start on a morning in Nice, spend your first day enjoying the treasures or the city, before you leave on car or train to La Brigue. La Brigue is at the railway line Nice-Cun�o. (if you want you can book a first night at B&B hotel in Nice (=extra night). If you arrive by airplane, the airport is next to the historic centre or Nice and you can go to the railway station by bus 99. The end of the walk is Menton. From here you can go to Nice by train to the railway station (Gare SNCF) and to the airport by bus. Bags transfer included B&B's Dinners Lunches Basic rate p.p. Lunches are not included. The price of a take-away lunch varies from 9 to 14 Euro. You can order it from the hotelkeeper the evening before departure. Solo all-in: add 57% at basic rate. Supplement single room included, bike rental not included. The path follows mainly the famous “Route Royale”, which was made by the lords or the Savoy to connect Nice with Pi�momt via the Col de Tende. The trail stays in the mountains, but never higher than 1200m, so it can be done in every season, even in wintertime. Departure from Nice to St. Dalmas at the end or the afternoon, either with your car (80 km) or with train (this and all other train journeys are not included in the package). Route: from Tende to La Brigue, over the Col de Boselia (altitude 1111m). downhill to La Brigue and walk to Notre Dame des Fontaines and back. Elevation gains :+400m and –400m, length 5 hours. - church with Baroque altar and Italian organ. Walk back to La Brigue and walk or by the train back to Saint Dalmas for your second night. Beautiful hike today, walking over so-called balcony paths along the Gorges of the Roya. From Saint Dalmas to Fontan and to Saorge, via the perched villages or Granile and Berghe. - Traditional architecture of Granile, one of the most beautiful mountain-villages of the Roya. From Saorge and the Roya valley to Breil. A very nice and not too long track, but with some considerable climbing. Night in Breil sur Roya. No trains today. 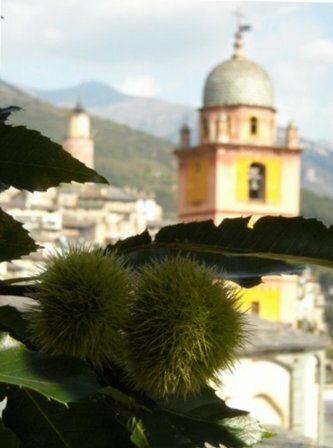 From Breil sur Roya to Sospel, via Pi�ne Haute, by beautiful balcony paths and along olive orchards. Leave by bus or taxi from Sospel to the Col de Castillon. From the col de Castillon to Ste Agn�s, via the summit or the Mont Ours(1239m). - Pay special attention to the military defences from the end of the 19th century (Serr�e de Rivi�re line) and 1936-1940 (Maginot line of the Alps), the village of Ste Agn�s above the sea and her enormous subterranean fort, part or the Maginot line. Freewheeling, or almost to the sea! Beautiful walk through pine woods till Castellar, then descent to the historic Menton and its old harbour. From Ste Agn�s to Castellat, via the path of the “Balcons de la C�te d’Azur”. From Castellar to Menton via le Baousset. Day 8 : Menton (or Nice) , leave after breakfast. Degree of difficulty : average. Hike of average degree of difficulty, accessible for anyone experienced in mountain walking. 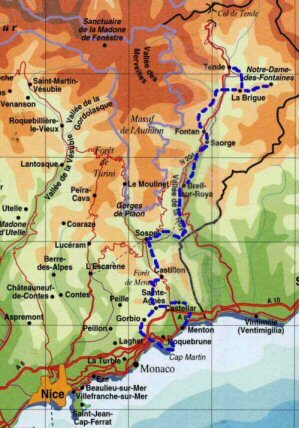 Particular difficulties: The C�te d’Azur, near the Italian border, is not a hilly region, but very mountainous, with a typical alps relief. The late autumn with its colours and the early spring with all the flowers are without any doubt the most pleasant periods to walk. During the winter it sure is much colder, but dry and very sunny. - Free choice of starting day and date. - Half-board (shops in every village to buy yourself a picknick) , single room possible. In Nice and Menton B&B. 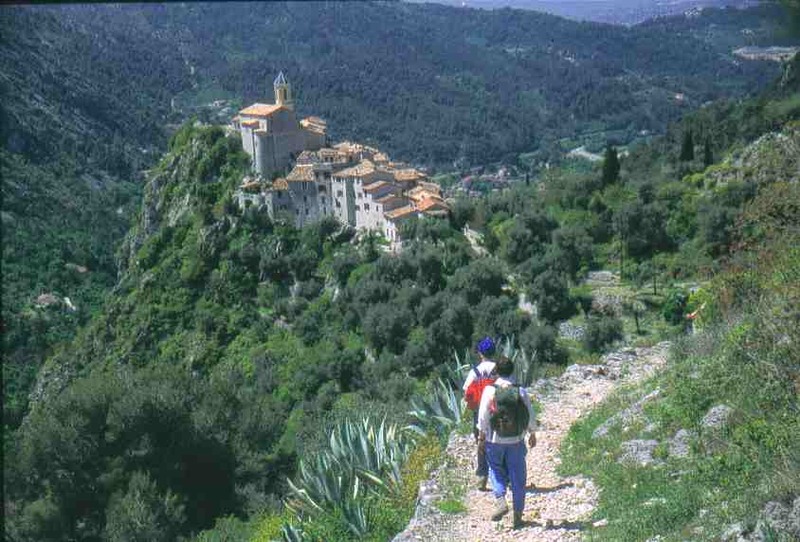 - Luggage transfer every walking day between La Brigue and Menton. - You get a description and maps, which you leave behind at the end of the hike (1/25.000) and detailed instructions. Not included are: beverages, entrance fees and train- and bus-tickets.